Saturday, Feb 27th - 6:30 to 3:30 - $125.00 - 16 Sells Out..
Sunday, Feb 28th - 6:30 to 2:30 - $110.00 - 16 Sells Out..
Wednesday, March 2nd - 6:30am to 3:30pm - $125.00 - 16 Sells Out..
Mussels now, this reef had been enveloped in sea whip prior to Hurricane Sandy. There remained a single mature whip this past summer - one survivor. See white star coral & a male tautog in the background. A shallow marine reef; wave energy from storms hits full-strength. If no new hurricane-like events occur over several years, it will again be grown over in whip. I served clients up a big ol' plate of SKUNK last Friday. Great mercy.. I went where tog live. Promise. Several places where tog live actually. They wouldn't have anything to do with what we were offering though. We did catch a handful of sea bass; it wasn't water temp that brought the ax down.. I first put it together solidly after hurricane Sandy. We were out monitoring artificial reef constructions; looking for movement or scour after the monster blow. Believe it - a hurricane can move a sunken ship. It's happened before. At least a week after Sandy, at two locations on our monitoring trip we dropped the video camera down and the screen simply went black after 30 or 40 feet. U/W cameras see better than the human eye down there - that's what every diver has told me. Even a moderate swell's energy can translate all the way to the bottom. Not a quickly built wind-wave set, but in deep bodied ocean swells energy is transferred to bottom silts. On last Friday's trip I thought we'd had enough time since the previous week's blow (with sea heights over 15 feet) for everything to settle. Apparently ripping currents had kept sediments suspended longer than I'd thought. I sure didn't sell tickets with, "MONSTER TOG GUARANTEED!" ..until Sunday two days later. On my last trip, 2/21/16, we had a fairly normal late-winter tog bite on a regular hours trip. Some guys had limits, while others, even highly skilled anglers who have caught thousands of tog, had to stop with me at the grocery store for chicken. It's the hardest fishery I know, in the hardest time of year. Honestly? I can't wait to go again.. This idea of blackwater - water so black that tog, flounder & cbass cannot feed - is not new. I understood it better after using u/w camera gear, but water clarity is hardly a new concern to anglers. Water clarity is, however, something I believe is worsening. Blackwater sure seems to take longer to settle these days.. This 'snow' (a super fine silt) is also part of what is collecting on our bayfloors. It's dead stuff falling slowly. A wicked snow-globe that will change the very nature of our ocean - is - has already changed our bays.. Crystal clear blue water has very little life in it. Dense green water has so much life it can block sunlight. Green algae, phytoplankton; all suspended in the water column - this is perhaps our greatest enemy. Light is vital, more-so than we currently could guess in our uninvestigated nearshore marine habitat. But when these light blockers--this phytoplankton, die in unimaginable number, bacteria pouncing on the sudden abundance of food use all available oxygen and create dead zones. Dead zones are now a regular summer feature of many estuaries. Huge areas occur annually in the Gulf of Mexico too. Lots & lots of work being done on dead zones. We're at the point now where light is getting blocked in the ocean too. Been that way a long time in our bays. Funny.. It's a nasty catch 22 for oyster aquaculturists that when oyster farming makes water clearer--and it does; then sea grasses, especially eelgrass, begin growing back on previously dead bottom. Oh No! Permit Violation! You're not allowed to have an oyster farm in an "endangered" grass bed. Oysters EAT cloudy water. Sunlight Penetrates. Grass Grows. These animals, these corals, (& not plants) are also capable of filter feeding. I don't think it a stretch that in the not too distant past sea whip off DelMarVa would have relied more on zoox-driven primary production from sunlight in high summer than filter feeding. The water, from all descriptions, even just 50 or 60 years ago, was fantastically clearer. 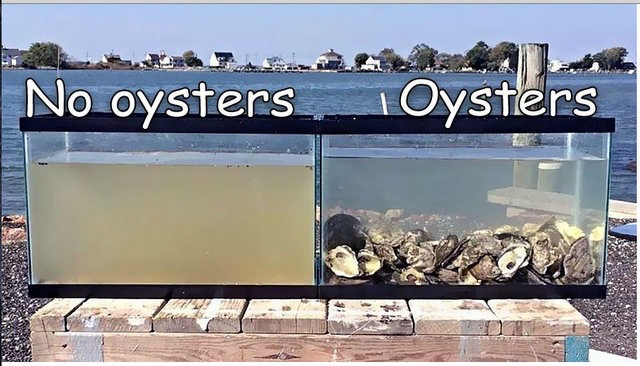 Have no idea who to give pic credit to..
No, we don't have oysters in the ocean. But most would be amazed at how badly we need estuarine oyster restoration in grand-scale to prevent marine collapse. Because we're pretty much out of oyster shell for all restoration purposes, the last administration crunched-up perfectly good boulders of fossilized oyster shell to mimic fresh shell. But the material was still larger than shell and not easily 'dredgable' -- the public pays to put out "reef restoration" -- dredges sell us the oysters for dinner. It's sorta like hatchery-raised trout, but on a different scale. The problem watermen see is crunched up rock is creating not-very towable/dredgable bottom. And fish nets get hung up on it too. That's because oysters are actually growing back on the fossilized shell - it has more vertical surface than plain shell. Terrible. Just terrible.. I wanted to keep the boulder whole - not crush them at all. Build UP into the water column - HIGH. Now the brakes are on the entire process. Virginia's downstream of Maryland in the Chesapeake. So long as VA builds enough reef capacity to biofilter the Bay's outflows, it is still possible we could restore Mid-Atlantic Ocean water quality if Virginia shouldered the entire burden. It's not John Wayne's America. Letting someone else shoulder your burden is how some get by in life. 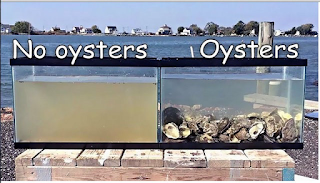 Assuming Virginia's success in creating an effective water filter; were Virginia to build the oyster reefs needed to restore blue water along our ocean coast, then rebuilding an incredible spawning population of oysters upstream in MD would really only benefit watermen anyway. Believe it. With enough oysters growing to filter a bay's worth of water, there's going to be incredible new quantities of spawn. Here's one idea on how to monetize massive new quantities of oyster spawn: De-needle & soak Christmas trees in loose, wet cement. Let dry. Suspend 3 or 4 trees from an anchored polyball just down current from an oyster reef biofilter come spawning season. Repeat with many Christmas tree 'spat traps.' After spawn move trees to fisher's own desired location..
Who said money don't grow on trees. Even as an experiment, this would require different thinking than of the last century & a half. I sure wish one of the heavyweights over there would try it. Make no mistake; the Mid-Atlantic Ocean has gone from 'deep blue sea' to green water. Lots & lots of green water. Getting greener too. Were we to take marlin boat crews of the 1930s, men who had only to go out 4 or 5 miles with complete anticipation of catching billfish; were we to show those crews of yesteryear today's water quality, they might well react as that famous EPA 'crying indian' ad from the 1970s.. In the mid 1980s old Capt. Jay Coleman used to deride any thoughts of marlin restoration by catch & release. "Why throw them back? We'll never see marlin again. The blue water's gone!" We have a real mess on our hands - promise. But NOAA sure knows what we caught! With only a quick glance I see where NJ Private Boats landed more tautog in two months than all US Party/Charter might have landed in 4 years..
Twelve Months - Annual - All United States Party/Charter Throughout The Entire Species Range.. I spoke with a partyboat skipper sailing from lower Jersey. He said he rarely sees a private boat togging, not even one, not even on calm days. Same with me. Save a couple local charter boats and an out of state ******, I see no private boats toggin in the ocean. I'm told at Jersey's north end it's heavier. There are private boats toggin up there. From what I'm told, a 50/50 split in catch would be close at Jersey's north end. The NJ estimate for Party/Charter is 7,000 pounds for Nov/Dec 2015 and 440,000 pounds for Private Boats in the same 2 months. To operate a party/charter you have to tell them what you caught or you WILL NOT get permits renewed. Yet in the MRIP data NJ Private Boats caught 63 pounds of tog for every single pound caught by all NJ Party/Charter..
Not quite 50/50 is it..
No one believes that MRIP catch estimate. Doesn't matter. Managers will continue to apply greater & greater catch restriction based on exactly these sorts of estimates. I've asked (begged really) for a system that flags bad estimates based on Vessel Trip Reports (VTRs are forms Party/charter operators have to fill out each trip). If management can reasonably expect Private Boat to even have 60 or 70% of recreational catch, then wild variance should be flagged. Every fishery, in every region, would have different percentages. It would not be simple to figure all of them out - but doable. Guarantee this: NJ Private Boats did not catch 63X NJ Party/Charter's tautog landings.. Regardless any obvious absence of plausibility, that catch estimate is on its way through the system. Because it's said to be "The Best Available Science," NOAA claims everyone involved with fisheries management MUST use estimates as-is. This one bad estimate will result in shorter seasons, longer size limits, smaller bag limits - Greater Catch Restriction. In this psychology experiment test subjects were told they were participating in a memory experiment. When persons in authority told them to apply greater & greater voltage, subjects complied even when there was clearly an impression the next shock could be fatal..
Man. The shocks keep coming - but they're not fake. Regulation is crushing businesses. Bad catch data has been driven into fisheries science & management like excrement into a wound. Despite the most heroic actions by managers I've ever seen of late, and I really mean that, this is an awful time in fisheries science & management. It's the estimates. NOAA demands their use. Management applies more voltage, more restriction, everytime a screwed-up catch estimate sails through the system unchallenged. NOAA tells them they have to. Fine tuning catch restriction not only demands we have a firmer idea of actual catch, but from my very first tag returns in the mid-1990s I could sense management areas for sea bass would have to shrink; that we could never hope to fairly control catch across the huge area from Cape Cod (which didn't even have a sea bass fishery then) to Cape Hatteras with a single quota. We were discovering sea bass only had short migrations offshore in winter followed by a return to the exact same summer spawning habitat. It was never probable that sea bass population growth would occur evenly across the entire management zone. Sea bass catches off Massachusetts, NY, or NC have no more influence on our region's population than fishing for sea bass in the Gulf of Mexico. Production occurs region by region, reef complex by reef complex. 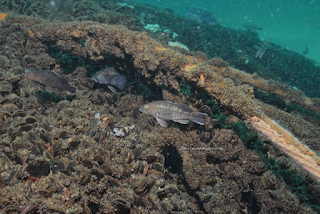 Habitat fidelity is so distinct that a small piece of wreckage only a couple hundred yards from a larger, but well known wreck, can have an amazingly robust population while the larger piece is fished down to size-limit only.. I wrote a piece, a comment on a sea bass management plan actually, Habitat fidelity as a management tool. 11/7/03 .. I've included it below. Despite almost perfect clarity from all sea bass tag returns, especially a big federal study by Moser & Shepherd, we still have the original management zone: Hatteras to Cape Cod. That's really causing problems. The sea bass fishery is being dismantled. NY may soon end up joining Rhode Island with a 3 or 4 fish sea bass limit. Over-limit pirates will win & win - unless they get caught. Jersey's limits are a wreck..
Regionalization is occurring, but lacks full scientific support. I'm sorry. What it really lacks is management's ability to use their own reasoning. They have to use "The Best Available Science." The further we get from the actual truth of fisheries science, the worse management's result will be. Regionalizing recreational sea bass regulations using MRIP catch data simply cannot work. Almost all our problems stem from catch estimates. It's everywhere in fisheries now - the pus of bad data infects scientific integrity. It wasn't so long ago, for instance, 2011 in fact, that NY's fluke regs were loosened to three fish at 20.5 inches. They had been at 2 fish at 21 inches. The reason they had those regs was because of MuRFSS. NY's worst year to pick for dividing quota was everyone else's best year. The founders built many stops into our political system to prevent what's called "tyranny by majority." The same level of thinking was not applied when recreational quota was divided..
You reckon if DelMarVa were caught in a similar squeeze by MRIP estimates, if we too had years of 20+ inch recreational size limits, that the 'sudden explosion' of large fish in following years would be blamed on recreational size limits conserving fish? ..or global warming. As in so many other instances, NY's regs had nothing to do with biology or true necessities of management - only mandatory response to MuRFSS catch estimates. Let me show you an interesting estimate. Maryland Ocean Coast ONLY - Shore Casters ONLY.. FROM THE BEACH ONLY. This estimate made my old friend Sue Foster, now sadly passed, nuts. "How can they be this dumb???" That 1999 estimate is 11,832 pounds greater than all Maryland's beach-caught estimates combined from 1981 to 2015 put together; 11,832 pounds greater than the other 34 years combined.. There were a lot of spikes in flounder estimates that year. Spikes are what drive regulation. These estimates need to find firm ground fast. Then management needs to BACK THE ESTIMATE ERRORS OUT OF REGULATION. Even if slowly. They're infection runs incredibly deep. . .
Dr. Bob Shipp was three time Chair of the Gulf of Mexico Fishery Management Council, past Chair of Marine Sciences of the U of S. Alabama, & remains Chair Emeritus at that University.. When he & I spoke briefly about MuRFSS catch data several years ago he told me, "The idea red snapper need restoring is a complete farce. There are more red snapper now than ever in history." His argument is based on habitat expansion and is not based on idle internet chatter. Yet, in the time since, catch restriction of red snapper, based entirely on MRIP's estimates, has grown incredibly worse. I see in 2013 Private Boats caught 2 million more pounds of red snapper than all US Commercial effort. They also caught 7X more red snapper than all US Party/Charter. One wonders if the Party/Charter skippers down there would disagree. Those I've communicated with sure do. Here is an article about red snapper's troubles through his eyes; a great synopsis of red snapper's regulatory derailment based on Dr. Shipp's life experience & knowledge. I think troubles with red snapper are not so different than any other reef species where habitat is ignored and catch estimates are allowed full control. Sound familiar? The only real difference from our sea bass or tautog is in its enormity.. Following my report last week a fellow sent this interesting half-hour HBO show about present day effects from the 5 year-old BP disaster. I'll keep nicking at it. I promise: If we have a major spill here, no one in charge will have any intent of skimming or removing the oil. They'll just spray it with dispersants - hide it - sink it. According to many reports, the dispersant is much worse than oil alone. Ah, some say, but we don't have oil wells. True. But we do have the largest oil tankers in history coming to service East Coast refineries. I got thinking about it in that NE blizzard a few weeks back. In the most likely weather to cause calamity, a NE gale, oil would be on our shores before we could stop it. Sure looks that way. Others too are hunting better alternatives for actual oil spill clean-up. And, finally, the state that just donated a million dollars of federal oyster reef money to its southerly neighbor is also looking at a house bill to reopen hydraulic clam dredging in our coastal bays. I'm 95% confident we were the last region to ban liquefaction of bottom for easier clam removal. Perhaps now the first to reopen? See old comment on habitat fidelity below. Many species of marine fish exhibit a high likelihood of returning to spawn at a given location. Salmon were probably the first fish to be noted for their well-known returns. Sea bass, my fishing specialty, certainly have a very strong bond to a spawning area. After overwintering offshore, they return every year to the same site. Scientists are finding more and more fish that demonstrate similar characteristics. There are also indications that these spawning subsets remain together geographically before and after spawning as well. It is possible that fisheries managers can utilize the growing body of habitat fidelity science to return depleted fish stocks to areas that they have thus far had little success. Porgy and codfish, both long gone from Delmarva, would benefit in our area by using such a strategy, as well as other species that are considered well on the way to rebuilding. Depleted stocks are seldom solely a result of fishing pressure. Often habitat loss also plays a role - whether "biogenic" as in a reduction of prey species or "physical" such as the importance of complex bottom growths for juvenile survival. Still, it is possible that a fish population in a given area is not as large as the existing habitat and management plan would support. Some species with strong management plans that have long been in place have had little success in returning to their full range. Weakfish (seatrout) and flounder (fluke) come to mind. Both species are shown to be on the rise, but along Delmarva have only had temporary spikes in abundance. If a species returns to a specific geographical area at certain times of the year and within specific water temperatures then the management plan should take that into account. It is certain that large concentrations of overwintering fish are being targeted given the over-sized portions of the annual quotas assigned - and filled - to the winter periods in the commercial fisheries. If a subset of a coastal stock were targeted, though unintentional, with heavy pressure, then fishers on that stock in the other parts of the year would see greatly reduced landings. It is possible that some stocks utilize areas that are more easily targeted by deepwater trawl gear and that other subsets of these coastal stocks are in areas more protected by bottom unsuitable for trawling. Or, it may be as simple as the amount of fuel needed to arrive at a fishing ground lessening the pressure on one stock while increasing pressure on another. Either way, in the winter fisheries care must be taken to divide pressure so that no subset is pummeled back to an 1980s level. Tagging studies to date are indicative, but not conclusive, in regards to overwinter habitat fidelity. Unfortunately, because of a low return rate in the commercial sector, only a very high reward tagging program would give the data needed to fully utilize habitat fidelity as a management tool. There is, however, very promising work being done with chemical analysis of otiliths (ear bones as it were, commonly used to age fish when their scales won't work) that could preclude the need for tagging. Apparently, chemical identifiers that are laid down in time sequence are unique in many areas. It may even solve the question of when fidelity begins. For instance, does a sea bass return to where it was spawned or is fidelity created at some later point. For many species this would be hugely important for more effective management. By aggressively using emerging science managers can protect all stocks of the multibillion dollar coastal fisheries.